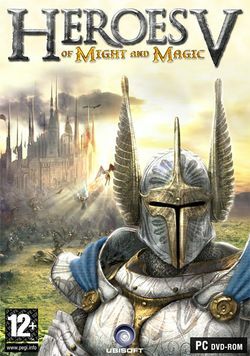 Heroes of Might and Magic V (also known as Heroes V or HoMM5) is the fifth installment of the Heroes of Might and Magic turn-based strategy game series. It was developed by Nival Interactive, under the guidance of franchise-owner Ubisoft. It was released in Europe on May 16, 2006 and later in the United States and Canada on May 24. The game requires a serial key for multiplayer use, but does not require one on installation. Griffin Eternal's king, Nicolai, is about to marry Greywolf's princess Isabel when demon forces interrupt the ceremony and separate the two lovers. Isabel is taken away from danger, where she makes the choice to help in the fight against the demon scourge. Starting with just a few forces, Isabel begins on a journey that will lead her through peril and into tragedy. This page was last edited on 16 August 2016, at 16:57.